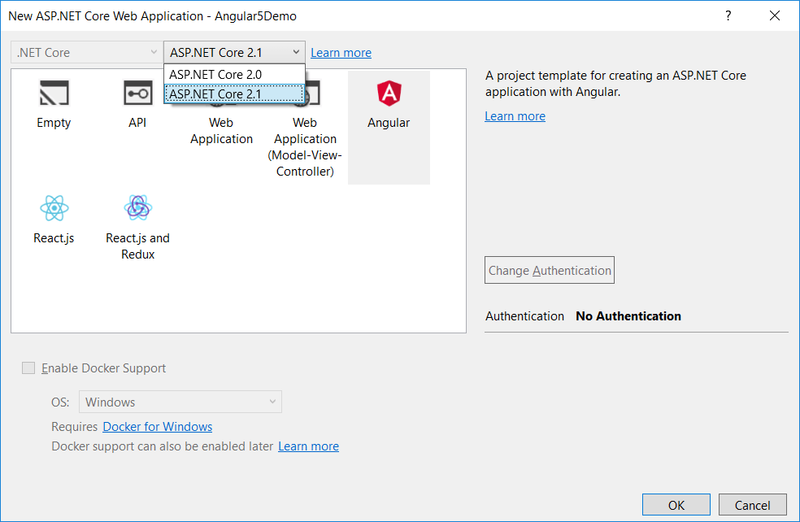 This post talks about how to upload a file from Angular 6 to ASP.NET Core 2.1 Web API. Make sure to select “ASP.NET Core 2.1” from the version dropdown and choose Angular. The Visual Studio will create an ASP.NET Core 2.1 based project with Angular 6 configured. This should create an Angular 6 app. You should run the app to make sure that there are no errors. To support uploading on the server, add a Web API controller named UploadController in the Controller folder. This controller has the API to upload the file and store it at a location. Add the controller with the following code. Here, we are also showing the upload progress in percentage. Thanks to Angular HTTPClient events. Next, we need to add the “Upload” link in the navigation bar. To do that, open the nav-menu.component.html file located inside the nav-menu folder and add the following code just after the “Fetch Data” link. The source code is available at Github. As you can see, it’s quite easy to implement if you have little knowledge of Angular 6 and ASP.NET Core 2.1.